The Kellogg teaching culture drives that success. The school celebrates its centennial in 2008, but the roots of its modern research orientation date back 40 years to a time when Northwestern University dismantled its undergraduate business curriculum in favor of a graduate MBA program. To do so, the school recruited faculty who were young and promising, but largely unknown (and therefore within the school's budget). The school also recruited the best students possible, many of them candidates that other schools had overlooked. That meant taking what Dean Emeritus Donald P. Jacobs called a "sideways approach" to recruiting, looking for nontraditional talent and employing personal interviews to get results. "Since we weren't a high-ranked school, the way we would get quality students was by interviewing everybody, something nobody else was doing," recalls Jacobs. The school also adopted a customer-focused approach, listening to students and creating a partnership with them. Kellogg established metrics to strengthen academics: Teacher course evaluations (TCEs) and, later, the Dean's Exit Survey, provided valuable short- and long-term feedback to enhance the overall MBA experience. TCEs, which are ranked on a 10-point scale, were made public, encouraging faculty to work harder. "Inevitably, we started competing against one another," remembers Mark Satterthwaite, one of those young professors who joined the school in 1972 and now is the A.C. Buehler Professor in Hospital and Health Services Management. "It's been a powerful thing; it's just remade the quality of teaching here." Today, the average faculty TCE is 8.4, remarkably high. Alongside the friendly competition grew a collegial teaching culture, with professors sharing their ideas about what and how they taught. The school established a mentors program and workshops where senior professors introduced new faculty to "the Kellogg way" of achieving classroom excellence. 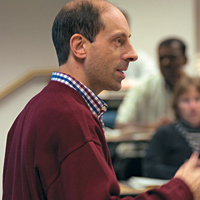 Among those credited by Dean Jain with reinvigorating the teaching culture was Stuart Greenbaum, Kellogg associate dean for academic affairs from 1988-1992. Merging research and teaching has become a Kellogg hallmark, and professors like Linda Vincent '94 see no contradiction in bringing the two together. "The interaction between what I research and what I teach has always been great," says Vincent, associate professor of accounting, who tells her students that "financial statements tell stories" and that accounting can be, well, fun. Her research involves financial reporting and capital markets. "If you don't have theory underlying what you're doing, the world is chaos." For Sergio Rebelo, the most important ingredient in teaching is mastery of the material. "This is why teaching cannot be divorced from research," says the Tokai Bank Distinguished Professor of International Finance. "Great business schools have to be research institutions, because the act of doing research, of studying, debating, and developing new ideas, is what forces us to have a deep understanding of the material and to keep our knowledge current." 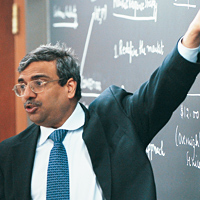 Kellogg professors also have the ability to convey these insights far beyond the school itself, says Sunil Chopra, the IBM Distinguished Professor of Operations Management and Information Systems and senior associate dean for curriculum and teaching. "Our faculty has done a great job converting their research into pedagogy, into textbooks and paradigms," he says, indicating a range of examples from finance and operations to marketing. "These are texts used by other top business schools. As a result, they have defined how courses are taught." Victoria Medvec creates a dynamic classroom experience by combining resources and strategies. 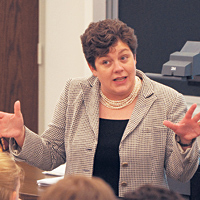 Medvec, the Adeline Barry Davee Professor of Management and Organizations and director of the Kellogg Center for Executive Women, says her students all want to see a connection between theory and practice, so she structures her classes to be highly interactive. "I don't believe adults can learn just by listening to a lecture," says Medvec, who also values the close link between research and teaching at Kellogg. The cutting-edge research that eventually appears in a Kellogg professor's textbook first shows up in their classrooms, Medvec says, so Kellogg students benefit from these ideas months or years before students at other schools. "This is something that really gives Kellogg students the advantage." 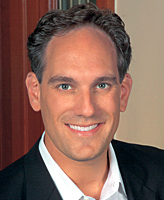 Doug Cook '98, president of Feldco, a Chicagoland replacement window, siding and door specialist, knows this firsthand. He considers his Kellogg education foundational for his career. A graduate of the Kellogg part-time program, Cook recalls the school's entrepreneurial and leadership strengths. He says that, in addition to courses in marketing analysis, classes that focused on managerial leadership, such as one taught by Professor Robert Neuschel, a former McKinsey executive, introduced Cook to key leadership models, including one later promulgated by Neuschel in his 1998 book, The Servant Leader: Unleashing the Power of Your People. "He was a wise gentleman who imparted the importance of leadership in the overall package of a professional," says Cook of Neuschel, who died in 2004. As an entrepreneur running his own company, Cook needed "to learn how to lead, not just manage, so having that taught to you at an early point in your career is important. I draw on that all the time." His experiences in Steven Rogers' Entrepreneurial Finance course are equally memorable and valuable, says Cook, who refers to the class as "jet fuel for an aspiring entrepreneur." Rogers, the Gordon and Llura Gund Family Professor of Entrepreneurship, has a dynamic teaching style that has earned him numerous awards. It's an approach that Cooks says aligns perfectly with the "electric and challenging" subject of entrepreneurship.